Our apologies to the cast of Gold Rush. The gold nuggets simply walk in the door here at KMG Gold Recycling. Customers regularly bring in gold nuggets they mined in the north west, or they found an old aspirin bottle full of gold in the basement left there from old Grandpa Joe. Gold nuggets, or placer gold, made by Mother Nature, contrary to popular belief, are typically 75%-85% pure gold, with some silver, copper, and iron. Pure gold is made and refined by man, not Mother Nature. 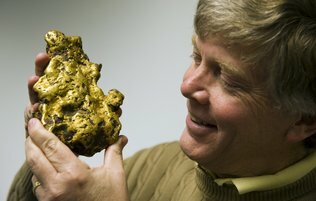 The discovery in Nevada County of a nearly seven-pound gold nugget last year has been called a one-in-a-billion find. Now, on the eve of the so-called Washington Nugget's auction in Sacramento, its finder has told the story. On top of uncommon luck, it's a tale of geological knowledge, high technology and elbow grease. The Nevada County resident had his undeveloped property—not far from the old mining town of Washington—assayed by a professional for possible gold deposits. "Just to see what gold would be down to the first 10 feet," the finder said, requesting to remain anonymous. There was some fine gold, and a hint that there might be more in the bedrock beneath the old mining tailings. A friend brought in a piece of equipment known as ground-penetrating radar. "We found an anomaly—a crevice or crack that indicated that would be a good target," he said. And this one was within 10 feet down—the outside limit for their backhoe. "We started to use the gold detector and we got a very strong signal," he said. All the time, they were working through groundwater that seeped in as they dug. The nugget they found would be worth more than $100,000 at current gold prices. Unannounced, the finder took it to Fred Holabird, an experienced mining engineer in Nevada. "His eyes popped out of his head," the finder said. "He screamed for everybody to take a look." "The Washington Nugget may be the sole remaining authenticated large gold nugget of 100-troy-ounce caliber from the California gold region," Holabird wrote in an essay on the piece. If it doesn't sell at auction, it may be finders keepers.